Puzzle Of Ice Age's Rapid Climate Change Solved? During the last ice age, a large part of North America was covered with a massive ice sheet up to 3 kilometers thick and that is a key reason why the sea level was then about 120 meters lower than it is today. During the cold stadial periods of the last ice age, massive ice sheets covered northern parts of North America and Europe. Strong westerly winds drove the Arctic sea ice southward, even as far as the French coast. Since the extended ice cover over the North Atlantic prevented the exchange of heat between the atmosphere and the ocean, the strong driving forces for the ocean currents that prevail today were lacking. Ocean circulation, which is a powerful "conveyor belt" in the world's oceans, was thus much weaker than at present, and consequently transported less heat to northern regions. Young Chinese scientist Xu Zhang, lead author of the study who undertook his PhD at the Alfred Wegener Institute, explains. "The rapid climate changes known in the scientific world as Dansgaard-Oeschger events were limited to a period of time from 110,000 to 23,000 years before present. The abrupt climate changes did not take place at the extreme low sea levels, corresponding to the time of maximum glaciation 20,000 years ago, nor at high sea levels such as those prevailing today - they occurred during periods of intermediate ice volume and intermediate sea levels." The results can explain the history of climate changes during glacial periods, comparing simulated model data with that retrieved from ice cores and marine sediments. During the extended cold phases the ice sheets continued to thicken. When higher ice sheets prevailed over North America, typical in periods of intermediate sea levels, the prevailing westerly winds split into two branches. The major wind field ran to the north of the so-called Laurentide Ice Sheet and ensured that the sea ice boundary off the European coast shifted to the north. Ice-free seas permit heat exchange to take place between the atmosphere and the ocean. 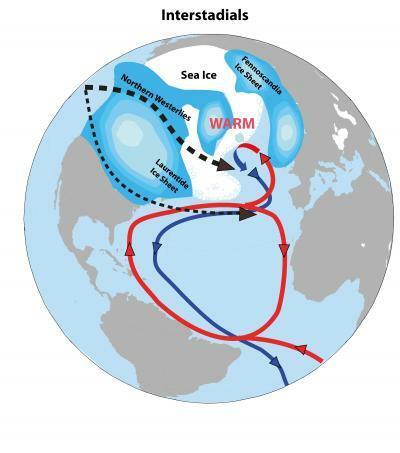 At the same time, the southern branch of the northwesterly winds drove warmer water into the ice-free areas of the northeast Atlantic and thus amplified the transportation of heat to the north. The modified conditions stimulated enhanced circulation in the ocean. 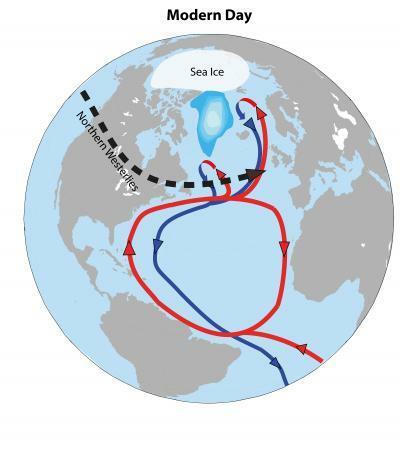 Consequently, a thicker Laurentide Ice Sheet over North America resulted in increased ocean circulation and therefore greater transportation of heat to the north. The climate in the Northern Hemisphere became dramatically warmer within a few decades until, due to the retreat of the glaciers over North America and the renewed change in wind conditions, it began to cool off again. "Using the simulations performed with our climate model, we were able to demonstrate that the climate system can respond to small changes with abrupt climate swings," explains Professor Gerrit Lohmann, leader of the Paleoclimate Dynamics group at the Alfred Wegener Institute, Germany. In doing so he illustrates the new study's significance with regards to contemporary climate change. "At medium sea levels, powerful forces, such as the dramatic acceleration of polar ice cap melting, are not necessary to result in abrupt climate shifts and associated drastic temperature changes." At present, the extent of Arctic sea ice is far less than during the last glacial period. The Laurentide Ice Sheet, the major driving force for ocean circulation during the glacials, has also disappeared. Climate changes following the pattern of the last ice age are therefore not to be anticipated under today's conditions. "There are apparently some situations in which the climate system is more resistant to change while in others the system tends toward strong fluctuations," summarises Gerrit Lohmann. "In terms of the Earth's history, we are currently in one of the climate system's more stable phases. The preconditions, which gave rise to rapid temperature changes during the last ice age do not exist today. But this does not mean that sudden climate changes can be excluded in the future."